Also known as equine assisted therapy, equine therapy is a therapeutic practice focussed on interaction between horses and patients. The therapy is often conducted by a mental health professional and an equine professional to ensure proper care is taken of the horses. 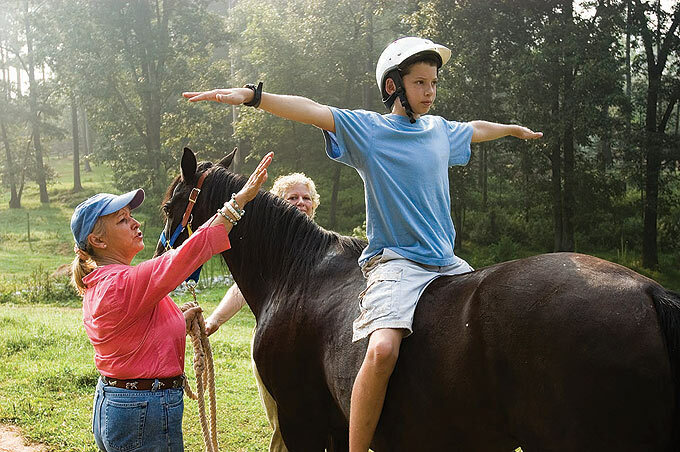 Although a fairly new practice, equine therapy is becoming more commonplace as more research is conducted and the benefits of the therapy are better understood. Equine therapy involves the patient performing activities such as grooming, feeding, haltering and leading a horse, whilst being observed by both professionals. This allows the therapists to detect any behavioural patterns and thought processes from the patient whilst they are absorbed in the activity. Documented research has also shown that interaction with horses can help to lower blood pressure and heart-rate, reduce stress levels and feelings of anger or tension, and increase levels of beta-endorphins. Horses by nature are very gentle animals and are highly advanced in mirroring the attitudes and behaviours of their human companions, helping alert the healthcare professionals to any underlying currents of unease or tension. Horses are also non-judgemental and passive, allowing the patient to feel relaxed and more at ease. Equine therapy is used to treat a wide range of mental health conditions such as; addiction, behaviour disorders, eating disorders, autism, Asperger’s, grief/loss, bipolar, depression and other related conditions. The therapy enables patients to identify their own behavioural patterns such as self-doubt and negativity, forming a basis for discussion and improvement with their therapist. The development of key skills such as accountability, responsibility and self-control. Helping to raise emotional awareness and empathy skills. Providing an outlet for stress and helping to manage it. Developing social responsibility and improving interpersonal relationships.